You are here: Home / Ed Tech / LMS & Learning Platforms / Whither Moodle? On e-Literate and even more so with our LMS market analysis service, we have called out many times the broad dominance of Moodle in terms of active installations worldwide. In every region outside of North America (US and Canada), Moodle has largest market share by far, and it is second place in North America. 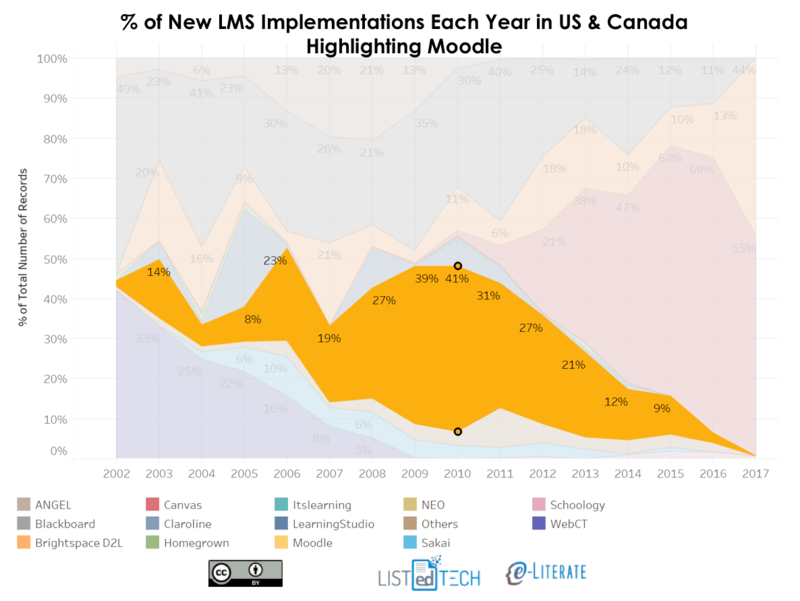 Remembering that 2017 is partial-year data, this view still shows that Moodle's selection as a new LMS has virtually ceased in the US and Canada after peaking in 2010. In that year 41% of new implementations were movements towards Moodle, yet by 2016 the number was down to just 2%. And for the first quarter of 2017, 0%. If we look at a combination of Europe, Latin America, and Oceania (Australia, New Zealand, surrounding island countries), we get a somewhat different story, however. In this view, the data is not so clear, and the peak years are later. In 2012 and 2014 an astounding 76% of new implementations were movements towards Moodle. But we might be seeing a change. In 2016 the number was down to a still-healthy 49%, but for the first quarter of 2017 it is only 3%. While we should avoid over interpreting 2017 partial-year data, the data seem to indicate a collapse of Moodle selections in the US and Canada, and potentially a significant slow-down in other regions. While not shown in the data above, a large number of the non-North American Moodle selections are coming from movements from standalone Moodle instances to Moodle Partner offerings, especially to Blackboard's Moodlerooms group outside the North America and to eThink in North America. There was an interesting response from Martin during the Q&A after his keynote, when someone (from a long-time Moodle-using university) asked for his view on the competitive nature of Canvas. Martin replied (and I paraphrase; someone correct me if I’m wrong) that Moodle is not profit-driven and it doesn’t matter that much when schools move to Canvas. What? The community, at least in the US, cares quite a bit. Moodle Partners care about their business, Moodle advocates care about the adoption and health of the open source community, and the level of Moodle development staff depends on how many schools choose Moodle over Canvas or any other solution. I get the point that Moodle HQ may not care for the same reasons as a VC-backed profit-driven company, but they should care. Instructure has signaled very strongly to investors that it plans to target the installed Moodle base for growth of its LMS, Canvas. Just last week the University of Minnesota, a long-time Moodle customer, announced that its 80k students and 6 campuses would be moving to Canvas. Ask Blackboard what happens when you take this company too lightly. We are seeing markets outside of North America (Europe, Latin America, and Oceania) becoming more like the local market in terms of LMS vendors under consideration for institutional adoption. Four providers - Canvas, D2L Brightspace, Blackboard Learn, and Moodle - get the lion's share of new selections across the four regions. If Moodle ceases to be a factor in higher education new implementations other than migrations to Moodlerooms and eThink, that is not healthy for the market. Four primary providers is already a small number - we need more, not fewer to keep all vendors honest and motivated to innovate. Looking further at our data, over the past two years the vast majority of Moodle departing institutions in North America have moved to Canvas; outside North America most Moodle departing institutions have moved to Canvas and Blackboard Learn and secondarily to D2L Brightspace; outside North America most new Moodle adoptions have come from Blackboard Learn and Claroline. When you combine the precipitous drop in new implementations with the observed movement from standalone or mom-and-pop Moodle installations to larger Moodle Partners like Moodlerooms, you see a broader movement towards cloud hosting and enterprise solutions. This is interesting in that Moodle is not feature-poor, but the support and hosting models of the big three proprietary vendors and the larger Moodle Partners seems to be a key driver for change. Note that all of the above is focused on higher education markets and not for K-12 or corporate learning. We don't want to cause too much alarm for open source advocates and for the Moodle community, as there is no risk in the near term for the installed base to reduce to unhealthy levels. But these data seem to show a big change to the world's largest LMS market position by a dramatic slowdown in new implementations. The question is where Moodle is going for higher education LMS usage. This should be a trend to watch, and one that I believe the Moodle community should discuss more openly. It would be interesting to see a count of total implementations. I wonder if there were fewer implementations in the first half of the year, for example. We’re actually seeing a spike right now, some of it coming from Pearson LearningStudio end-of-life and large for-profits migrating. But other activity still moving along. I’m actually of the opinion that the U of Minnesota moving to Canvas at the price they will be paying for the next few years is probably a good thing for the U of Minnesota and Moodle both. I don’t think much instruction will be significantly hampered because of the move and will likely even be improved. I also don’t think the loss of a self-hosted site like the U of Mn is much of a drain on Moodle in general. There has not been a huge financial contribution by the U of Mn to Moodle and the amount of development contributions from the U of Mn has fallen off, mostly because, I think, of the impending and widely expected shift to Canvas. This mess of eggs got cracked three years ago and they weren’t cooked over easy. I’m personally looking forward to recruiting some of the U of Mn folks who know Moodle and will now be looking for new projects to help with the work we’re doing at SABIER moving OER full courses onto Moodle.